The Firefly Lounge brought a large dose of strong and powerful soul to Bellingham on May 17, expanding on the former Green Frog’s well known weekly soul night. This was the first stop on the duo release tour for Raquel Rodriguez’ newest single “Mile High” and Moorea Masa & The Mood’s debut LP Shine a Light. Anyone walking into the venue this evening, could obviously see that the three bands combined had a solid town following. It was largely apparent that the audience members were well aware of the musical talent about to ensue, and brought a positive and energetic vibe to match. Mōtus, a local seven member neo-soul funk jazz band, kicked off the evening for their second show at The Firefly Lounge. As seen time and time again, Mōtus mesmerize audience members with a wide range of exuberant talent. Their all encompassing sound, inclusive of strong harmonies, horns, and funk, made it nearly impossible to find anyone in the crowd who wasn’t grooving and dancing along to the music. Not only does this band have a soulful funk vibe, resemblant of modern day jazz, R&B, and soul groups, they also have purposeful lyrics addressing political and social issues, as heard songs like “Gold River”. The night was far from over by this point, and the crowd’s excitement about what was to follow was clear. Next to the stage was West Los Angeles native, Raquel Rodriguez, who has worked with well known musicians such as Gwen Stefani, Moby, and Watsky. To say that her passionate vocal talent was incredible would be an understatement. Using inspiration from her hometown’s fusion of diverse culture definitely helped build her own fusion of funk, synth, and R&B pulled from the 70s and 80s. As expected, her newest single, “Mile High,” was a definite crowd pleaser with a classic R&B rhythmic vibe and funky bass. Though the last two musicians shared many of the same band members, they each brought forth their own style of soul and range. This show brought an extra special element for both Moorea Masa and Raquel Rodriguez, because the two were touring alongside the musical stylings of their significant others, Sam Brawner on the drums and Steveland Swatkins on the keys. With the majority of the band members remaining to play the final set, Moorea Masa stepped to the stage along side female vocalists Haley Johnsen and Margaret Gibson Wehr. The group’s musical magic brought the crowd chills through heartfelt lyrics and beautifully executed harmonies. Her song “I Can’t Tell”, had the audience singing along to the sentimental and romantic words, highlighted by her partner’s grin as he played the keyboard to the beautifully written song. Masa’s lyrics from her album Shine a Light, undeniably reflected her passion and life experiences in a smooth and soulfully artistic manner, making for a clear choice in connection between the three different bands. Though some may refer to Sunday as a day of rest, this was definitely not the case at The Shakedown on May 20. Seattle band, La Luz, was booked for the night and their Bellingham fan base made a point to be present, filling the entire venue. 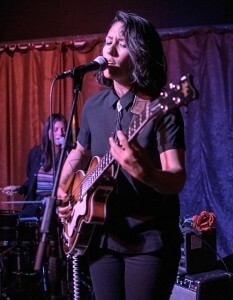 Though the original opener, SÁVILA, was unable to make the show, the local replacement ended up being the perfect complementary vibe for La Luz. The Wednesdays are a rock/femme punk band inspired by 90s rebel grrrl roots. The band started off the night with full and exuberant sounds of screaming vocals and killer riffs. Their songs, fused with blues ressemblent vibes and raw honest lyrics, spoke to the crowd with with clear messages about what it’s like to be femme, queer, and navigating the journey of life. All of these key ingredients blended together creating a perfect execution of distinct punk sound that filled the crowd with excitement right from the start. Throughout the opening band’s performance, the crowd continued to grow exponentially with every song and continued to do so even after La Luz began to play. With the floor packed, and the energy high, La Luz kicked off their set with a new instrumental song, “Floating Features”, off of their recently released album of the same name. La Luz is a purely female four person band whose genre can best be described as a mix of surf and 60s garage rock. As the crowd watched and listened to their smooth harmonies and rhythmically snappy sounds, they became entranced. The band’s setlist was the perfect blend of old and new hits, making sure to check off every fan favorite while also introducing the audience to the phenomenal new material they had worked so hard to produce. With this being the case, it was not surprising that the originally declared “last song” left the entire room wanting more, leading to badass encore following the crowd’s request. The encore began with a brief Pearl Jam cover, and wrapped up the evening with their song “Sure as Spring” off of their 2013 album “It’s Alive”. Bellingham patrons were given a badass gift of raw talent that Sunday night, and there was no doubt that it left everyone craving more to come. SISTERS and Polecat, two brilliant bands who graced the Wild Buffalo stage together last month. SISTERS bring electro funk synth-heavy progressive jazz while Polecat is well known for their groovy American folk jam style. What they have in common is a seamless ability to meld together genres that are often kept separate. That being said, the quiet night in Bellingham was over once SISTERS struck that first note. Seattle-based SISTERS is a duo made up of Emily Westman and Andrew Vait. Westman rapped on the drums, standing for their entire performance. Vait took up five instruments including the synth, flute, guitar and saxophone. The very best part of this opener was that many in attendance, those who had come for the headliner, legitimately had no idea what they were about to experience. 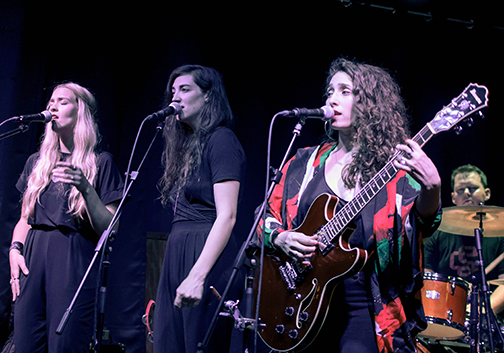 Performing songs from all three of their albums, SISTERS blew the crowd away. SISTERS are not only an exceptional pair of musicians, they are enthralled with playing their songs together; it creates a wave of joy throughout the venue as they perform. As they began we were brought into the stage with enthralling alternative jams like “My Little Head” off their latest album Wait Don’t Wait. In this song the pair perform harmonies using raw emotion as they showcased their ability to draw in unknowing bystanders from their seats at the bar. Smoothing out into the final songs of their show, the dance floor started moving with funky jazzy tunes like Heart Beats. This song features Westman slapping the drums while crooning along with Vait and his saxophone solo. The pair most certainly know how to play, but most importantly, they transfer joy they feel performing together to their audience. After SISTERS left us satisfied and smiling the crowd began to stir waiting for hometown heroes Polecat to grace the stage. The Pacific Northwest-based jam band is comprised of Cayley Schmid, Richard Reeves, Aaron Guest, Karl Olson, and Jeremy Elliott. Their style melds between Americana, folk, Celtic, rock and reggae featuring Schmid on the violin, Reeves on the upright bass, Guest on the 12-string guitar and keys, Olson on the drums, and Elliot on acoustic guitar. Polecat is a band with five individual performers who mesh together in impeccable fashion. Their individuality is what brings that indefinable quality that makes Polecat special, because the solos were only made better by the complimentary sounds brought out from their bandmates. As a newer Bellinghamster, it became clear very quickly that Bellingham shows up for a Polecat show. And frankly, Polecat didn’t disappoint as they ripped well into the night. For those that missed this one, both bands can be found playing shows this Summer throughout the Pacific Northwest. Traditional American roots music is normally experienced through a lens of the past. Field recordings from the mountains of Appalachia and southeastern US still bring listeners to that tried and true space of raw emotion and heightened storytelling. Thanks to the keen efforts of contemporary musicians like McKain Lakey, this rich tradition lives on to engage our current age with an intended infusion of modern thematic content. With the same charged spirit of honest songwriting which engrained old time music, McKain lives and breathes a new perspective with bold insight to open dialogue. She views her music as an opportunity to challenge the oppressive societal and cultural systems which birthed the aesthetic of early American music – a heartfelt passion which she loves to the core. By definition, murder ballads are a genre within the oral tradition of Americana which weave stories of crime and violence told from the perspective of either the criminal or the victim. In McKain and Mordechai’s presentation, the focus was brought to violence directed at women in traditional music. McKain spoke passionately about how women were subjugated at this time in America’s history. And how songs depicting murder or domestic abuse were inevitably passed on to a younger generation of musicians looking for fun melody and a good rhythm. In ignorance, however, this paradigm only served to celebrate the murder ballad narrative and continue its thematic presence in day to day society. Through beautiful and intense original compositions and covers from days gone by, including Elizabeth Cotten’s “Freight Train,” McKain brought goose bumps the whole way through. Holding a degree from Berklee College of Music and trained in the clawhammer style of banjo, she mixed musical virtuosity with one of the most amazing voices you will hear anywhere. A time capsule unearthed, fine-tuned and re-imagined, McKain Lakey shared her exciting perspective on Americana with fullness of heart and soul. At the high point of an inspired afternoon, McKain shared “Sadie’s Song,” an original murder ballad composed for fiddle and written from the lyrical perspective of a woman going through a violent domestic encounter. Chilling, engaging, jaw dropping emotion – words cannot depict the feeling of experiencing the song’s performance in person. The narrative we hand to our kin becomes the narrative of their paradigm. Today’s enthralling performance and discussion proved that we need to tend to the music and stories we pass to our children. For what we reap… is what we sew. To hear “Sadie’s Song” in its entirety from her new album West, visit https://mckainlakeymusic.bandcamp.com.